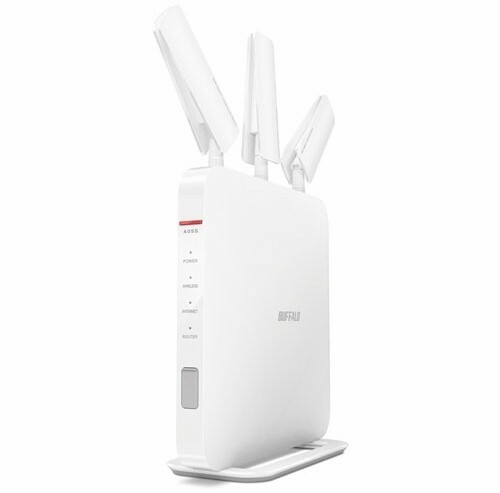 The WXR-1900DHP Gigabit Dual Band Wireless Router is Buffalo's third AC class router we've looked at. Previously, I reviewed the WXR-1166DHP AirStation Extreme AC 1200 router and Scott reviewed the WZR-1750DHP AirStation Extreme AC1750 router. The new WXR-1900DHP is a departure from the previous two routers as it has three high-gain "helicopter" blade antennas sprouting out of the top of the case. The previous models relied on internal antennas. The chart below, supplied by Buffalo, shows the current dual band router product lineup. The user guide for the WXR-1900DHP wasn't available on the Buffalo's U.S. website at time of review. However, there is an HTML version of the manual available on Buffalo Japan's website. The callout diagram below shows a summary of the front panel LEDs. Similar to the its AC1200 and AC1750 siblings, the WXR-1900DHP uses a combination of multi-color LEDs and blink patterns to provide a lot of information into just a few indicators. One difference worth noting: The WXR-1900DHP has its single USB 3.0 port on the front. A couple of things are worth mentioning about the WXR-1900 DHP rear panel. The WAN (Internet) port becomes a fifth Gigabit LAN port in bridge or AP mode. A USB 2.0 port is included to supplement the USB 3.0 port found on the front panel. Other Buffalo AC class routers had only had a single USB port. The bottom of the WXR-1900DHP has a single mode switch to easily change between router, AP and bridge modes. This switch replaces the two switch configuration found on the rear panel of Buffalo's other AC class routers. There's also a reset button here. The photo below shows the component side of the WXR-1900DHP main board. This photo was taken from the FCC certification photos and has all heat sinks removed. Near the top you'll see the three 5 GHz power amplifiers just below the two antenna connectors. The 2.4 GHz power amplifiers are to the right side of the PCB adjacent to the three antenna connectors. For this review, we choose three other AC1900 class routers for comparison: the Linksys EA6900; NETGEAR R7000 (Nighthawk) and TP-LINK Archer C9. For each, I compiled the comparative key component summary below. You'll note that the Buffalo WXR-1900DHP has the same components (but more RAM) as the chart-topping NETGEAR R7000. We'll see in the performance portion of this review if the Buffalo router can join the NETGEAR router at the top of the charts.